One evening while getting ready for bed, I realized there were some new additions to my fragrance collection. Could it be? The Fragrance Fair has visited me! There were two new full-sized bottles of my favorite fragrances: Shalimar Parfum Initial by Guerlain, and Nanette Lepore. My husband, after reading my review of the Shalimar Parfum Initial sample that I received from Scentbird, and then hearing my disappointment about it finishing went out and purchased for me the Shalimar Parfum Initial fragrance set that came with a 3.4 Fl oz bottle of perfume and body lotion. If you remember my review I had my reservations about the Guerlain Fragrance. I thought Shalimar Parfum Initial was outside of my age demographic, and more for a more mature woman, around my mom’s age. To my surprise, after first spray, it quickly became my favorite. I really have to thank Scentbird for introducing me to a new fragrance that I’m more than happy to add to my fragrance collection. Since receiving the Shalimar Parfum Initial set, I’ve been wearing it almost every other day to work. It’s such a beautiful scent even in the warm weather. The lightness, the soft powdery fresh scent is reminiscent of my other favorite Guerlain fragrances. Normally, I do not like the body lotions that accompany perfumes in gift sets because they tend to be watery, sticky, non-moisturizing, and at times, have an off putting scent. The Shalimar Parfum Initial body lotion was the complete opposite. The texture was different, and felt like a luxury cream, which I would expect from a brand like Guerlain. It smelled just as good as the perfume, making it great for layering, and helping the fragrance last longer throughout the day. 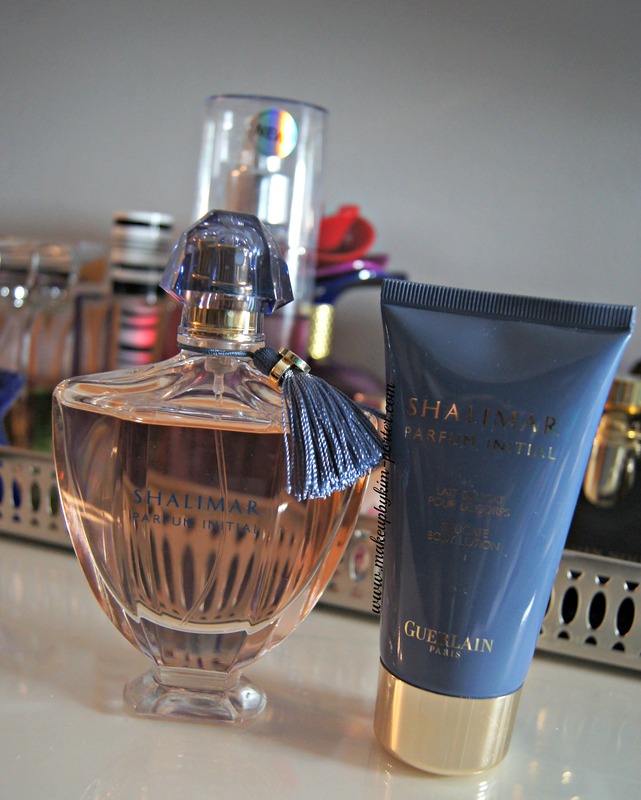 The bottle of the Shalimar Parfum Initial is gorgeous! I like simple things, and this one is just that. It’s a clear, wide bottle with a blue topper and tassel. I Even in all of its simplicity, it still manages to make a statement amongst the rest of the perfumes on my vanity. The other perfume my husband picked up for me was Nanette Lepore, which I’ve reviewed here previously. The light pink bottle, with the black and white polka dot bow adds a pop of vintage to my perfume collection. The lovely floral fragrance is one of my favorites to wear during the spring and even the summer, as it isn’t too sweet. I was honestly surprised that my husband even found the Nanette Lepore fragrance because after speaking with her nephew during an even I’d once attended, I was under the impression they were going to [get rid of it]. Imagine my surprise when I came into my bedroom right before bedtime and found two bottles of Nanette sitting amongst my perfumes on my vanity. 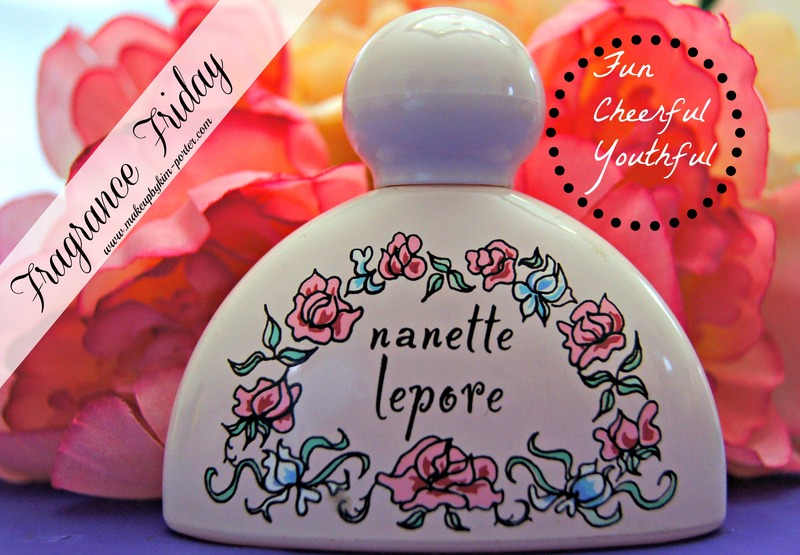 The nearly empty bottle from my April 2012 post, and a new bottle my husband surprised me with I’m happy Nanette Lepore did not discontinue this fragrance. 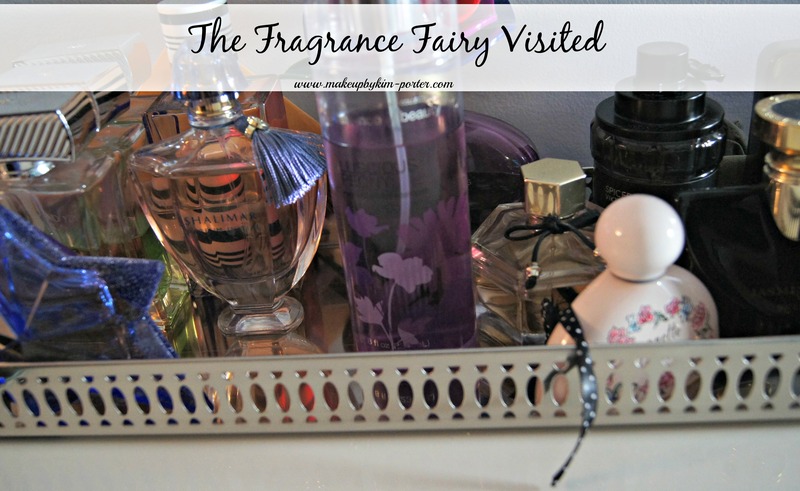 What fragrances are you hoping the Fragrance Fairy leaves for you next? What a wonderful husband you have!! How is the flanker, Shalimar Parfum Initial, different from the regular Shalimar? I used to wear Shalimar when I was in college, but I still love the scent. I remember on my first trip to Paris when I was in college I went into a store and I wanted to buy Je Reviens, and the saleswoman said to my, "C'est pour les grandmeres!". I was humiliated and I bought the Fleurs De Rocaille by Caron that she suggested for me at age 20. It was a mistake. Age has nothing to do with it. If the scent goes with your body chemistry and personality, you're all set. L'Heure Bleu from 1912 is still one of my favorite scents although the formula seems to have been changed over the years, boo hoo. From what I remember about the original Shalimar, this one in comparison is a lot more fruity, but not in the sense that it's overly sweet. I agree, age really has nothing to do with the perfume you wear, and it really depends on what best suits you, your chemistry and personality. There was a Halston fragrance one of my aunts wore all of the time, it was on the spicy side, I've always loved it even as a child. That bottle is enough of a selling point for me! The original Shalimar is the only fragrance I ever bought for myself. Your husband is terrific by the way. I loooove the bottle design on the Nanette Lepore perfume! Oh that bottle is gorgeous! I love trying new fragrances! A very attentive husband you have there! I''d love for the Fragrance Fairy to leave me a full sized Flowerbomb. I never tried Shalimar, but I heard a lot about it. It seems to be one of the most iconic fragrances! I need a fragrance fairy, cab I borrow your husband? The Nanette Lapore fragrances are so lovely and the bottles a delight! My recent post DIY Brown Sugar Foot Scrub for Sandal-Worthy Feet! aaawwwwww, what a sweetheart your hubby is!! Wow, that's a great fairy! Our house has a toilet paper fairy, that replenishes the bathrooms when they're low, and I thought that was a great fairy..but yours is maybe better! lol. LOL you are hilarious. That's a good fairy to have, too. We all need TP. The Nanette Lepore fragrance bottle is really cute. Never tried this but that bottle is definitely an eye site I love. How pretty it is.